Theremin World - Topic: Theremin Recording to Computer-- Squealing and static sounds? Theremin Recording to Computer-- Squealing and static sounds? I am having an issue recording my theremin and I'm hoping if anyone has experienced this or can help. So, I am trying to record my Moog Etherwave Plus (ESPE01 modified) theremin by connecting its headphone output to my laptop's mic input via an aux cord, and recording with Audacity. What I am getting is a bunch of weird noise and squealing that reacts to the pitch field, even when my hand is touching the volume loop to silence it. When I plug headphones straight into the theremin's headphone jack, it sounds fine. When I connect my iPod to my computer's mic jack, it can record with no weirdness. I've posted a recording on YouTube of me playing "Over the Rainbow" so you can hear what I'm talking about. Near the end the noise gets really quiet when I touch the pitch antenna. Also, I didn’t have this issue last time I recorded to my laptop, which was last month. Sounds like the unwanted tone is tracking the volume hand position? I imagine the EWP isn't doing the best job of filtering out ultrasonics at its output, which is aliasing the laptop input. "Sounds like the unwanted tone is tracking the volume hand position? I imagine the EWP isn't doing the best job of filtering out ultrasonics at its output, which is aliasing the laptop input. If the ultrasonics are being conducted in through the cable, the solution is to filter them out. A multi-pole RC or two pole RLC would probably do the trick. You want passive filtering her so as to squash all the RF. As a first pass you might try a ground loop isolator, which will kill interference coming in through the ground, and will also give some RF filtering: https://www.amazon.com/Mpow-Ground-Isolator-Stereo-System/dp/B019393MV2"
My first thought is always get a better earth ground. The sound is so un-natural for an EWS, I would bypass the add-on pro section completely at first. I was once very active on this theremin board, cleared out my hobby room, now can't find anything. Now have a better hobby, she is 20 years younger than me @ 47 years old. It would have been better for me if she were a nurse. 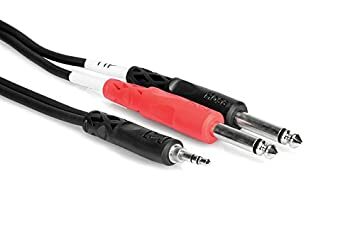 On a standard EWS without the Pro section add-on I use a cable similar to below. The computer input is stereo while the EWS output is mono. The problem you are experiencing “might” be caused by the computer input having the wrong cable configuration which could be shorting out the mic input, then you turn the volume way up and hear mostly background noise. Your other devices work fine because you are using a stereo cable, 3.5mm TRS on both ends.